I suppose that if your argument is that the # of STEM grads is the determinate for military superiority, then take cover. 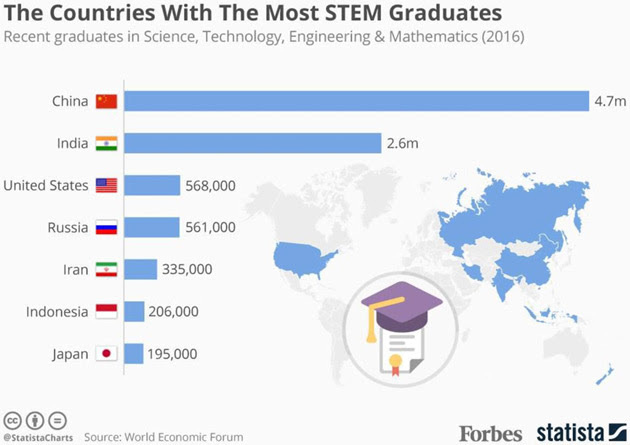 Russia is about to be invaded by India which has about 5 times the number of STEM grads . . .
Science and engineering aren't only put to use in the weapons industry. India seems to be more interested in space, and its achievements are quite remarkable for a country which has only recently got involved in that area. I am unable to tell where the reporter actually got those numbers from when I look at the supposed source. And countries and universities lie about this stuff all the time. And Russia's weapons are junk. Fortunately for us all, Putin is wiser than you are. Apparently we may rest assured that STEM grads in Russia are all devoting their energies towards developing the best military weaponry possible. After all, what good could possibly obtain from non-military pursuits? A country under constant attack must acquire the means to defend itself. Russia is encircled by NATO bases, is accused of all sorts of crimes, without any evidence being ever provided, is under economic and financial sanctions, is under constant threat of further attacks and sanctions. Russia must therefore have the military means to guarantee its enemies will not prevail. I, for one, am happy that Russia and China are increasingly capable of stopping US imperialism and aggression. Many Europeans may not realize it, but our safety depends on Russia, not on NATO. Yeah, you pull a measly few hundred assassinations and everyone is all up in your grill.